University of Chicago Press, 9780226344690, 640pp. “Walden. Yesterday I came here to live.” That entry from the journal of Henry David Thoreau, and the intellectual journey it began, would by themselves be enough to place Thoreau in the American pantheon. His attempt to “live deliberately” in a small woods at the edge of his hometown of Concord has been a touchstone for individualists and seekers since the publication of Walden in 1854. But there was much more to Thoreau than his brief experiment in living at Walden Pond. A member of the vibrant intellectual circle centered on his neighbor Ralph Waldo Emerson, he was also an ardent naturalist, a manual laborer and inventor, a radical political activist, and more. Many books have taken up various aspects of Thoreau’s character and achievements, but, as Laura Dassow Walls writes, “Thoreau has never been captured between covers; he was too quixotic, mischievous, many-sided.” Two hundred years after his birth, and two generations after the last full-scale biography, Walls restores Henry David Thoreau to us in all his profound, inspiring complexity. Walls traces the full arc of Thoreau’s life, from his early days in the intellectual hothouse of Concord, when the American experiment still felt fresh and precarious, and “America was a family affair, earned by one generation and about to pass to the next.” By the time he died in 1862, at only forty-four years of age, Thoreau had witnessed the transformation of his world from a community of farmers and artisans into a bustling, interconnected commercial nation. What did that portend for the contemplative individual and abundant, wild nature that Thoreau celebrated? Drawing on Thoreau’s copious writings, published and unpublished, Walls presents a Thoreau vigorously alive in all his quirks and contradictions: the young man shattered by the sudden death of his brother; the ambitious Harvard College student; the ecstatic visionary who closed Walden with an account of the regenerative power of the Cosmos. We meet the man whose belief in human freedom and the value of labor made him an uncompromising abolitionist; the solitary walker who found society in nature, but also found his own nature in the society of which he was a deeply interwoven part. And, running through it all, Thoreau the passionate naturalist, who, long before the age of environmentalism, saw tragedy for future generations in the human heedlessness around him. “The Thoreau I sought was not in any book, so I wrote this one,” says Walls. The result is a Thoreau unlike any seen since he walked the streets of Concord, a Thoreau for our time and all time. Laura Dassow Walls is the William P. and Hazel B. White Professor of English at the University of Notre Dame. She lives in Granger, IN. "One of the ten best books of 2017." 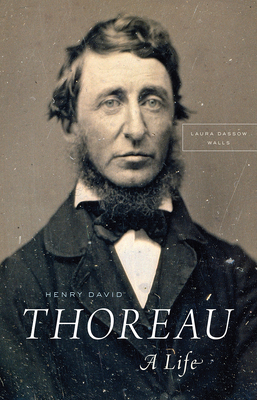 "Laura Dassow Walls has written an engaging, sympathetic, and subtly learned biography that mounts a strong case for Thoreau's importance. . . . Thoreau's political engagement isn't exactly news, but Walls foregrounds it vividly. . . . The details are sometimes wonderful. . . . Walls's Thoreau is truly a man for all seasons, a person who, in many ways, is a 21st-century liberal’s idea of our best self: pro-­environmental, antiracist, anti-imperialist, feminist, reformist, spiritual but not religious. It is extraordinary how much there was in Thoreau to support this interpretation, and part of the power of Walls's book is how she traces these liberal and humane preoccupations to the radicalism of his family and of Concord’s intellectual life." "In this definitive biography, the many facets of Thoreau are captured with grace and scholarly rigor by English professor Walls. By convention, she observes, there were 'two Thoreaus, both of them hermits, yet radically at odds with each other. One speaks for nature; the other for social justice.' Not so here. To reveal the author of Walden as one coherent person is Walls's mission, which she fully achieves; as a result of her vigilant focus Thoreau holds the center--no mean achievement in a work through whose pages move the great figures and cataclysmic events of the period. Emerson, Hawthorne, and Whitman are here; so are Frederick Douglass and John Brown. Details of everyday life lend roundness to this portrait as we follow Thoreau's progress as a writer and also as a reader. Walls attends to the breadth of Thoreau's social and political involvements (notably his concern for Native Americans and Irish-Americans and his committed abolitionism) and the depth of his scientific pursuits. The wonder is that, given her book's richness, Walls still leaves the reader eager to read Thoreau. Her scholarly blockbuster is an awesome achievement, a merger of comprehensiveness in content with pleasure in reading." "I've always been slightly skeptical of biography doorstops. . . . I read the book in two sittings. It will not be used as a doorstop--ever. . . . Walls, scouring his published and unpublished writings, gives her readers hundreds of these fleeting chances to catch sight of a beautifully untamed but distinctly American existence. . . . Walls comes as close as any biographer has to giving us the wild Thoreau--disorienting and bewildering." "Superb. . . . Exuberant. . . . Walls paints a moving portrait of a brilliant, complex man." "A superbly researched and written literary portrait that broadens our understanding of the great American writer and pre-eminent naturalist. . . . Magnificent. . . . A sympathetic and honest portrait that fully captures the private and public life of this singular American figure." "Study the living being, not its dead shell. And this is precisely what Walls has done in her definitive life of this opinionated, often difficult, but always interesting writer. . . . To her great credit, Walls gives us so much more than the quotable Thoreau, the bane of the American literature survey course. . . . She immerses herself and her readers fully in Thoreau’s environment, the fields, meadows, woods, and streets of Concord. Walls’s book is, first and foremost, the product of an extraordinary act of empathy. But it is also an outstanding literary achievement. No biographer has more credibly evoked those blisteringly cold, crystal-clear New England winter days, days that, thanks to Walls’s prose, sparkle, glimmer, and chill for us the way they once did for Thoreau. . . . The great imaginative accomplishment of Walls’s book is to put Thoreau firmly back into the community that fostered and, for the most part, protected him." insisted on his own way of seeing the world, however quirky. . . . Walls earns her keep, digging into Thoreau’s aphoristic letters and journals, finding acute reflections by his contemporaries, and drawing a wonderfully brisk and satisfying portrait. . ."
"This new biography is the masterpiece that the gadfly of youthful America deserves. I have been reading Henry David Thoreau and reading about him for 40 years; I’ve written a book about him myself. Yet often I responded to Laura Dassow Walls’s compelling narrative with mutterings such as 'I never knew that' and 'I hadn’t thought of it that way.' I found myself caught up in these New England lives all over again. . . . On a foundation of rigorous scholarship, Walls resurrects Thoreau’s life with a novelist’s sympathy and pacing." "Beautifully written, this is a substantial volume in which every page feels essential. You won’t want to put it down." "Not only does the biographer capture the breadth and depth of Thoreau’s relations and work, she leaves us tantalized, wanting more." "Luminous. . . . Through Walls's biography, Thoreau once more challenges us to see, with his passion and intensity, the world in all its cruelty and its splendour, riddled with human lies and abundant in natural truths." "Splendid . . . offers a multifaceted view of the many contradictions of his personality." "Exhaustive, exhilarating. . . . With a light touch and prose equal to her subject, she introduces us to a Thoreau we need right now: a scientist, a moralist, a radical democrat, and an artist who might stir us to realize the highest ideals of self and nation." "Laura Dassow Walls has written a grand, big-hearted biography, as compulsively readable as a great nineteenth century novel, chock-full of new and fascinating detail about Thoreau, his family, his friends, and his town. Walls's magnificent--landmark--achievement is the best all around biography of Thoreau ever written. It not only brings Thoreau vividly back to life, it will fundamentally change how we see him. We will hear no more about the 'hermit of Walden Pond.' Walls has given us a new socially engaged Thoreau for a new era, a freedom fighter for John Brown and America, and a necessary prophet and spokesman for Concord Mass. and Planet Earth." "This volume is a rich introduction to Thoreau for those unfamiliar with him and an almost casually brilliant reintroduction for those who know and love him." "Will be for many years to come the biography that readers will turn to in fruitful search of a life 'whole and entire.' It will supply good answers to the question of why Thoreau still matters, two hundred years after his birth." "Every year, there is at least one new book about the life of Henry David Thoreau. But only once per generation is there a new, all-inclusive, scholarly biography. Laura Dassow Walls's 666-page door stopper is the one we have been waiting for--the most authoritative biography of Thoreau ever written."